The strength and distinct feel of aluminum has made it timeless and the choice of architects and homeowners alike for windows and patio doors. Light yet strong, aluminum frame windows and patio doors can be configured into a wide variety of combinations. The narrowness of the frame places the focus on the glass and subsequently, the view it offers. Multi-panel glass walls are often made with aluminum frames to facilitate indoor/outdoor living. Milgard aluminum frames are available in anodized or baked-on finishes for long lasting color. Sealed, mechanically joined corners stay square and true over years of use. Because aluminum conducts heat and cold well, Milgard offers a Thermally Improved Aluminum frame in select regions. Thermally Improved Aluminum windows and patio doors are equipped with thermal breaks to separate the interior and exterior surfaces and reduce heat transfer. Extremely popular with architects, aluminum windows help accentuate the clean lines of modern design. 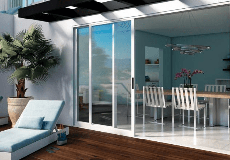 Popular with architects, aluminum patio doors help accentuate the clean lines of modern design. Aluminum Series are not only beautiful, they are extremely durable to achieve unique architectural vision.